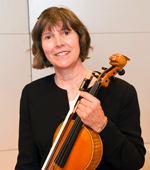 Wanda B. Lydon has been a violist in the San Antonio Symphony for over 20 years and is Principal Viola for Des Moines Metro Opera. A graduate of Interlochen Arts Academy, she attended the University of Iowa on scholarship. She completed further studies at University of Washington with Donald McInnes, at Roosevelt University with William Schoen, and with Wayne Crouse of the Houston Symphony. Wanda’s very talented family included: her grandfather, Forrest L. Buchtel, a famous band composer and arranger; her grandmother, who played in the Women's Symphony of Chicago and had her own String Quartet for many years; her mother, Bonnie Cataldo, who played cello in the Milwaukee and Houston Symphonies. Wanda is a member of the music faculty at The University of the Incarnate Word and also teaches privately using the Suzuki method.